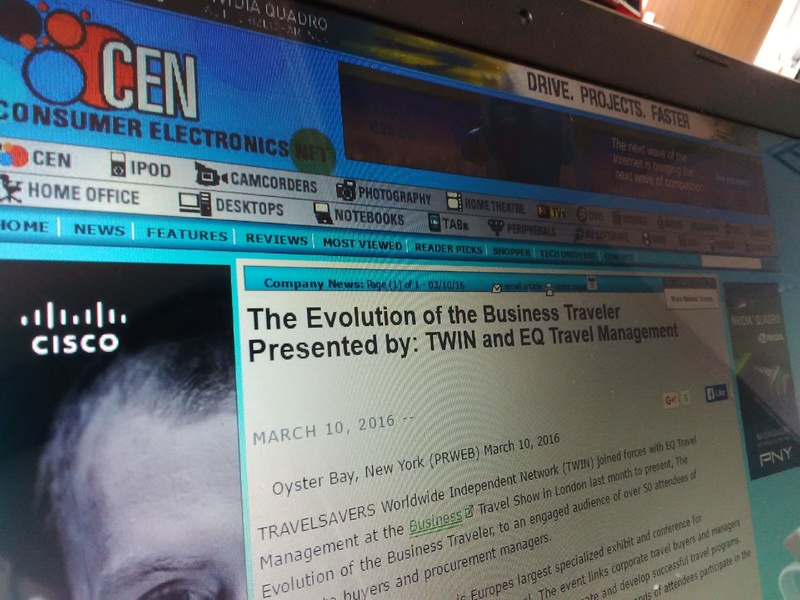 TRAVELSAVERS Worldwide Independent Network (TWIN) joined forces with EQ Travel Management at the Business Travel Show in London last month to present, The Evolution of the Business Traveler, to an engaged audience of over 50 attendees of corporate buyers and procurement managers. The Business Travel Show is Europes largest specialized exhibit and conference for buyers and managers of business travel. The event links corporate travel buyers and managers with suppliers, knowledge and contacts to help create and develop successful travel programs. Over 250 suppliers, more than 175 expert speakers and thousands of attendees participate in the conference. Speakers: Franc Jeffrey, CEO, Duncan Sanders, Operations Director, Nicola Wilson, Client Relationship Manager of EQ Travel Management and Betty Tilton, Vice President, TWIN used their expertise to reveal how technology and travel today is woven into the fabric of everyday life. The rise of millennials as business travelers is growing exponentially and 32% of them book travel via a smartphone, says Franc Jeffrey, CEO, EQ Travel Management. These travellers view life as limitless, unrestricted and infinite. They mix work and play and as a result, while corporate travel programmes must ensure policy adherence they need to be flexible and easy to access with intuitive tools. Bleisure trips, or ones that combine business and leisure, are rising fast as a common form of travel worldwide, according to a new report from Bridgestreet Global Hospitality published by Skift. This next-generation corporate traveler will demand a tailored experience. Capturing and capitalizing on big data, technology and a fresh critical look at your existing travel program will allow you to deliver better pricing and personalized service, says Betty Tilton, Vice President, TWIN. TRAVELSAVERS Worldwide Independent Network (TWIN), is a global travel management company that provides end-to-end travel solutions for corporate clientele of all sizes. Leading travel management companies participate as licensees in this powerful network. TWIN provides the infrastructure, technology and resources to help them find new accounts, service multi-national accounts locally, obtain foreign business from other members, take advantage of inbound business, coordinate joint RFPs and provide business travelers with the most efficient and professional travel assistance available. TWIN has an in-country presence in five continents. EQ Travel Managements experience goes beyond technology and methods. EQ Travel are experts in corporate travel management, with services covering a range of industry sectors and specialist areas. As an employee-owned business, every member of EQ is invested in our success so every one of us is dedicated to providing an industry-leading standard of service. We know that a successful travel management programme doesn't only offer value for money, but also delivers the events, activities and experiences that support your business aims. Our goal is to identify where money can be saved and where value can be added. Our team is made up of seasoned travellers: who have flown all over the world, attended countless conferences and slept in hundreds of different hotels helping us deliver the best possible journey for the best possible price. In addition, to corporate travel EQ offers: Conferences/Events/Incentive/Clinical Trials/Group Travel/ Oil & Gas Logistics and leisure. For more information visit: http://www.eqtravel.com.